Ever since JM was a toddler, we have tried the chore chart/commission system (a.k.a. “allowance”), but changing our living spaces and traveling so often has made consistency in this area rather difficult to establish routine. We are now in a home that is also a family worship gathering space, artist studio, and more. We have bedrooms that also serve as breakout rooms, a school room that doubles as a space for B.I.G. Kids (Beginning In God), and it is a necessity to remain tidy and clean for guests and friends. Therefore IT. IS. TIME. for routine. In developing hard-working heart-led children, rewards and incentives are a PLUS! 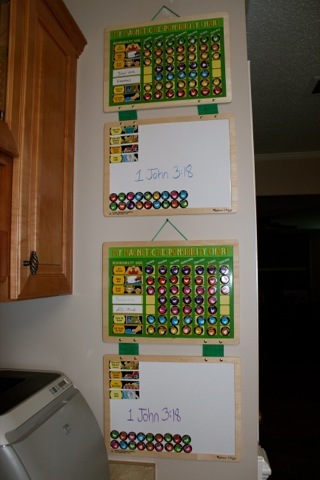 We have always attempted The Three Jar money concepts with the kids, teaching them that when they receive money, God gets the first 10%, then they set 10% aside to save, and the rest can go toward reaching set goals for toys, special outings, gifts for others, and other life stuff. It’s very easy for kids to get the “Wow, really!? Out of these TEN one-dollar bills, God only asks for ONE?” blessing. This is the year to see those disciplines through with them. They are both old enough, and eager. JM is now nine. He outgrew his toddler banks a while ago, but has never once complained. JMan’s Toddler Banks that are being put to rest. The football represented GIVING, because when you throw a pass, you let it go! The piggy represented SAVING, well, because… it just made sense that you fatten up a pig for later, right? And the Leap Frog bank was for SPENDING so that as he had a specific toy in mind, he could type in the goal amount and then see the coins count higher to reach the goal right before his eyes (and ears—it talks too). Fun . . . until you have outgrown Thomas the Tank Engine and your friends want to see your room and all your stuff. Thanks to some Pinterest browsing, I came across what a friend from Atlanta did for her banks (her site is AMAZING and I highly recommend you browse!). Today I set out, after a trip yesterday to the beloved Hobby Lobby, to make our very own. STEP ONE: Collect and open the jars. We chose cookie jars because they were the cutest, easy for hands to reach inside, and they can stand up OR tilt. STEP TWO: I made circles on the back of contact paper the size of the lids. These circles were for Sadie’s flowers, as I drew the flower pattern INSIDE the circle lines. STEP THREE: For JM’s, I just wanted circles (remember, he is growing up, so we couldn’t go from toddler banks to girlie flower ones!). So I found a glass that fit INSIDE the lids, and used that to trace around in order for the circles to be smaller than the lid space. NEXT: I grabbed my trusty chalk ink and wrote GIVE, SAVE, and SPEND on the black contact paper shapes that I had cut. !! !THIS IS IMPORTANT!!! — It was a bear to get the lids to read straight because I had written them on the counter and then screwed them on. I SHOULD HAVE done the writing WITH THE LIDS ON, to ensure even and level words. Lesson learned, and thankfully, you can always peel and re-situate contact paper. SOOOOO… Screw ON the lids. THEN position the contact paper and write them upright, as shown with the middle jar. You can tilt them AFTER they are dry and won’t drip. 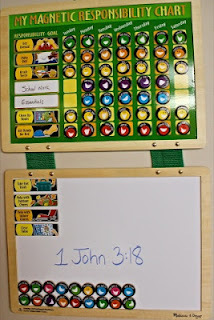 Here is a look at their RESPONSIBILITY CHARTS (Thanks Mom, for picking them up at Barnes and Noble!). We begin the week with all of the magnetic smiley faces ON THE CHARTS and then as they accomplish the tasks each day, they remove them from the board and drop them into their Earning Buckets, commission bins, reward buckets, whatever you want to call them. At the end of the week, they exchange those tokens for money, dividing their earnings by category into the GIVE, SAVE, and SPEND jars. There are extra bonus tokens each week for things like Scripture memory or extra work projects that come up for the home or the ministry. Earning Buckets are stationed in the cubbies next to the Responsibility Chart Wall. Buckets fill up at a steady pace! The extra space at the bottom is for bonus jobs. As you can see, I have a bit of a Chalk Ink obsession. 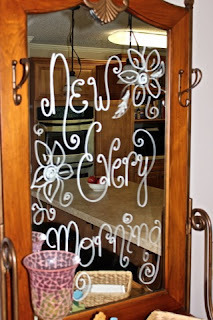 Mirrors all around the home have special messages regularly. This one is by the coffee bar in the café. With all the work to tackle this school year, we will need new mercies every morning . . . and lots and lots of coffee! Have a great kick-off to the 2012/13 school year!